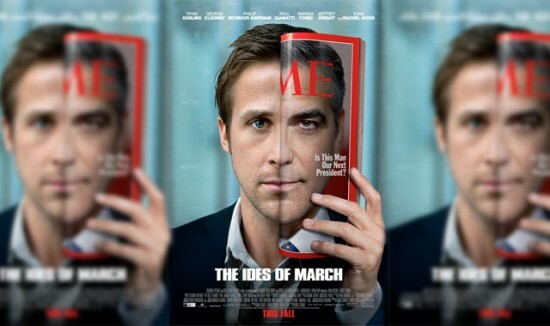 Hitting the internet simultaneously with that well-received trailer yesterday was this unusual poster for George Clooney’s Venice curtain-raiser “The Ides of March.” It’s always nice to see designers attempting something a little more conceptual than the norm — indeed, the simple split-face gimmick here could almost be taken as an ironic rebuttal to floating-head convention. Most interesting, however, is the tripling of the core composition into a UK quad-style format: it’ll be a duller poster when it’s inevitably chopped vertical for multiplex use, but it does raise the point that with posters all debuting online these days, there’s little initial reason for a standard format. Anyway, nice job — check out the full one-sheet after the jump. It’s funny how George Clooney’s face is what immediately sticks out to me about that poster. I wonder how many people won’t even be able to make out that’s Ryan Gosling without being told / reading the names above and deciding which one fits with his face. He’s a pretty big star (and getting bigger every day it seems) but I’m not sure he’s quite well known enough yet that people can recognize from half of his face (and that juxtaposed with a much more recognizable one). None of that is a complaint about the poster, which is excellent… it’s just an observation. Ryan Gosling is a terrible actor. He’s so stiff. And when he tries to convey emotion, he just comes off as a drama student trying too hard. How do people take this guy seriously? @SJG: I noticed Gosling first, actually. Probably because Gosling is more attractive. @Pete: Have you actually seen his films? The performances Lars and the Real Girl and Half Nelson can be described in many ways, but stiff is not one of them. He’s a terrific, nuanced actor, who eschews shouting and histrionics for subtle intensity and character introspection. The only performance of Goslings that I’ve ever had an issue with was Blue Valentine. As raw and wonderful as he was at times, it felt to me like he was getting to lost in what he was doing. So lost to the point that I felt Gosling could have been physically destroying himself and I worried more about the actors well-being than the characters while I was watching the film. It’s the kind of issue that I often have with Christian Bale is that he seems so undisciplined and so uncontroled when he gives performances. I’m sure they both have more of a grasp on those performances than you give them credit for. :P Those are still brilliant, at least. For me, the only performance that I wasn’t impressed with (having never seen [i]The Notebook, rofl) was [i]The United States of Leland[/i]. But that film is a giant turd to begin with, so terribly written/conceived, so I don’t hold it against him. It was just rather ‘limp’, and actually a prime example of the mumbly end of the spectrum we discussed in the other topic, Drew. :P Otherwise, he’s one of the best. @the Other James- I’m not sure if it’s possible to say one is more attractive than the other when it comes to two ridiculously attractive people… but I guess it’s also a matter of personal taste. This poster immediately reminded me of the ads in D.C. (or at least the only place I’ve seen them) regarding AIDS awareness… it’s a mash-up of George W. and Obama’s face… so eerily similar. Fantastic poster. It’s early, but things seem to be coming together for Clooney and Ides. As for Gosling, I find him to be one of the most exciting actors we have. His taste in projects is fascinating. He broke my heart wide open in Half Nelson and Lars and the Real Girl. Blue Valentine was an admirable if murky film. Williams, I think, understood her character more than Gosling did his. But I will say Blue Valentine, in my mind, belongs to the female protagonist. Ryan’s character become something of a set piece as Williams discovers she’s in a marriage she never really wanted. So I think part of Ryan’s confused, if earnest, performance comes from a script that wasn’t quite sure what it wanted to say. Other James D: As brilliant as they may be, I still get the feeling that these guys sacrifice themselves foolishly for their art at times. They may craft fine performances, but I imagine that working with them in a state of misinterpreted method acting would be a volatile nightmare. And any story of a result of such work would seem like it was more a plea for accolades than a commitment to an artform. I love watching Gosling, but actors of his generation have a tendency to lose control, which can result in dire consequences. I’d go down the Heath Ledger route, but I don’t feel like reading the caps lock filled rants of fanboys. You know, I belive there is a real degree of truth to what you are saying, especially in relation to Bale. I too, often times, wish I could enjoy the performancew for what it is without having to feel as if I’m forced to worry about external elements, that frankly, have as much do with acting, even method acting where it’s ultimately all about feelings, as props do in ice skating. Bale’s more natural performances are easier to enjoy (The Prestige, The New World, Public Enemies) I feel like his weight loss in ‘Machinist’ and Rescue Dawn make it harder to look past the transformation.